Catalonia has "won the right to become an independent state" the region's president has declared, after a disputed referendum saw 90% vote for independence. Nearly 900 people were injured as riot police armed with shields, batons and guns with rubber bullets clashed with peaceful protestors and unarmed civilians who had gathered to cast their ballots on Sunday. Police were under orders to shut down a vote described as "illegal" by the Spanish government. The European Commission has called on all sides in Spain to move "swiftly from confrontation to dialogue". EU chief Donald Tusk also appealed to Spanish Prime Minister Mariano Rajoy to "avoid further escalation and use of force". Mr Tusk spoke to the Spanish leader, and said that even though he said shared the constitutional reasoning for not recognising the referendum, he wanted the violence that marred the poll not to be repeated. Catalan regional government spokesman Jordi Turull said 90% of the 2.26 million Catalans who voted, did so in favour of independence, while 8% rejected it. The rest were blank or void, and 15,000 were still being counted, he added, although those don't include the ballots confiscated by Spanish police. The region has 5.3 million registered voters. After the polls closed, Catalan president Carles Puigdemont said he would keep his pledge to declare independence unilaterally from Spain if the "yes" side wins. He added he would appeal to the European Union to look into alleged human rights violations during the vote. Today the Spanish state wrote another shameful page in its history with Catalonia. After the majority of polls closed Sunday, Spanish Prime Minister Mariano Rajoy thanked the police, saying they had acted with "firmness and serenity". Spanish Foreign Minister Alfonso Dastis said the violence, while "unfortunate" and "unpleasant" was "proportionate". If people insist in disregarding the law and doing something that has been consistently declared illegal and unconstitutional, law enforcement officers need to uphold the law. It is unclear what will happen if Catalonan officials actually declare independence. The region is one of Spain's most prosperous, and many yes voters want more autonomy than they currently have, arguing they contribute more than they receive from the central government, which controls areas such as taxation and infrastructure. There were violent scenes in the region's capital, Barcelona, where the political situation was even played out at the city's famous football club. The team played its La Liga match behind closed doors at an empty Nou Camp, but the home team came out for the game in the colours of the Catalonia flag, while opponents Las Palmas had Spain flags embroidered into their shirts. 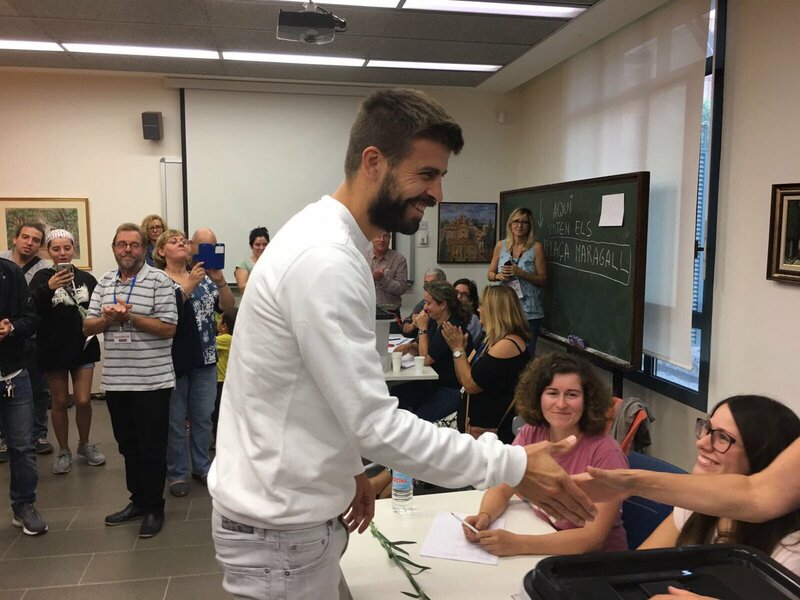 Barcelona player Gerard Pique was pictured casting his vote before the game, and in a post-match interview the Catalan born defender condemned the police violence. In an interview with AS, he said he was ready to stand down from Spain duty if he is deemed a "problem" by his national team manager. The people protested without violence. I thought they would try to stop the vote in a peaceful way. Everyone has seen what happened. They've made things worse. This is among the worst decisions in the last 50 years. They've separated Catalonia from Spain even more and there will be consequences. Amateur video showed some officers dragging people out of polling stations by the hair, throwing some down stairs, kicking them and pushing them to the ground. By the end of the day, Catalan health services said 844 civilians had been treated in hospitals for injuries, including two who were in a serious condition and another person who was being treated for an eye injury that fit the profile of having been hit by a rubber bullet. Spain's Interior Ministry says that 431 National Police and Civil Guard agents suffered wounds or bruising during the clashes. The ministry says that 39 officers received immediate treatment but none were hospitalised. The remaining 392 suffered minor injuries and bruises resulting from kicks, bites and scratches. The ministry had previously reported 33 as the number of officers injured.